Despite reaching a new peak share price for 2013 that pushed Apple's market capitalization above $500 billion, the company's valuation remains where it was in the spring of 2012, at a time when analysts were predicting Apple's market cap would soon double. In April 2012, analysts Gene Munster of Piper Jaffray and Brian White of Topkea Capital Markets had both set price targets envisioning Apple reaching $1000 per share within the year, a price that would have pushed the company very close to a one trillion dollar valuation. Apple surpassed analysts' estimates for iPhone sales in that spring quarter, beginning an upward stock trajectory for 2012 that peaked in September 2012 at around $700. In August, White described Apple's rise as particularly worthy of note because other companies that had reached such a high valuation, including Microsoft, Cisco and Intel, had only done so after achieving dominance in their respective markets. Unlike Microsoft's 90 percent market share among PCs at its market cap peak, or the 80 percent share Intel held in PC CPUs, or the 70 percent share of networking products Cisco held, Apple's share of PCs remained at just 4.7 percent, and the company's share of smartphones was figured to be at 64.4 percent, according to numbers from IDC. That indicated plenty of room for future growth. White also contrasted other companies that had reached $500 billion valuations, including General Electric, Exxon-Mobile, Cisco, Intel and Microsoft, as having fat price-to-earning ratios of over 60 times, compared to Apple's ratio of just 10.7 times its estimated 2013 earnings. However, just one month later Apple shares began crashing to earth, dropping over 20 percent to lose $142 per share by the end of the year. Despite continued record sales and the wildly successful launch of both iPhone 5 and the new iPad mini, Apple's shares remained weak as pundits drew attention to new competition from Android led by Samsung. Analysts and investors quickly changed direction in their outlook for Apple, guiding the company's valuation sharply downward throughout 2013, reaching lows in April and June below $400 that paved the way for a huge buyback program. 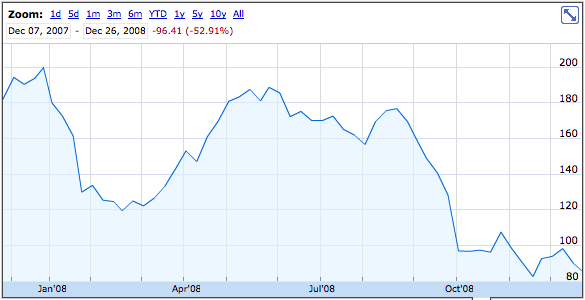 Apple's stock whiplash of 2013 was not nearly as dramatic as its bipolar meltdown in 2008. At the beginning of that year, Steve Jobs admonished employees to "hang in there," writing, "our stock is being buffeted around by factors a lot larger than ourselves." Jobs added, "I continue to believe that our fundamentals - our remarkable people, our clear and focused strategy, our new product pipeline, our 200+ retail stores, our $18 billion of cash in the bank with no debt, etc., will serve us well in the coming months and years." Over the winter of 2007, the first holiday season of iPhone, the company's shares had plummeted from highs near $200 to a low of $119 within two months. Shares then recovered by the end of May only to crash back to $82 by November. The insanity of Apple's 2008 valuation roller coaster is particularly noteworthy in hindsight, given the uniqueness of the iPhone as an unquestionably innovative and profitable product with tremendous growth potential. Throughout 2013, it was new concerns about innovation, growth and sustained profitability that dogged the company's valuation. Apple's shares haven't dropped as dramatically this year as in 2008, but wild shifts have involved far larger swings in dollar scale. Between its January high point of $549 to the recent close at $556, Apple shares have lost and regained over $150 billion in market valuation, more than Apple's entire peak valuation in 2008 and nearly twice as large as investors had priced the company as being worth by the end of 2008. When Apple reached $700 last year, it coincided with Google's stock reaching the same share price (although Google has far fewer shares outstanding, resulting in a lower total market capitalization). 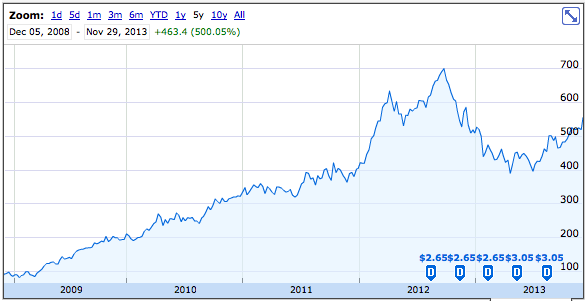 Since then, while Apple plunged below $400 and has since recovered to $550, Google's shares have reached above $1060. 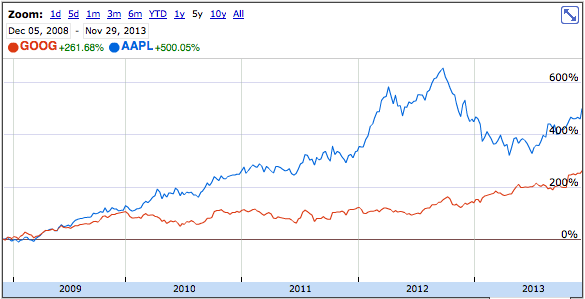 Apple's market cap is still much higher than Google's (just above $500 billion compared to $354 billion). However, if Apple had tracked a similar share price trajectory as Google over the past year, its market cap would now be over $950 billion, right where analysts had been predicting Apple would go. Apple's poor performance relative to Google over the past year is only observable when constraining the view to 2013, a year that so far has only registered a flat chart for the world's most valuable and by far the most profitable computer and phone vendor. Backed out to five years, Apple has performed nearly twice as well as Google. After punishing Apple with wild swings and a tremendous net loss of valuation (twice!) in 2008, the market more than doubled the company's valuation in 2009, setting a upward trend that, ignoring the surge of 2012 and its slump in 2013, points straight forward toward a short term destination of $600. The other difference between Apple and Google is that Apple has bought back billions of dollars worth of its outstanding shares over the past summer, dropping the company's share count from a high of 940 million shares last September to just under 900 million shares today. Rather than buying back shares, Google has been issuing new ones, growing from around 328 million shares last September to today's peak of over 334 million. At a share price of $1060, Google's extra 5.5 million shares have invented over $5.8 billion out of thin air, at the expense of the dilution of value of its shareholders. And of course, Apple has also paid out over $10 per share in dividends over the past year, while Google has no dividend. Overall, this seems to indicate that the confidence analysts placed in Apple's fundamentals at the beginning of 2012 was correct, and its impact on the company's actual share price was simply delayed by a misinformed, year long ripple of irrational trading behavior, as was clearly the case in 2008.